1. WHAT IS VICTOR'S FULL NAME? Victor's full name was Victor John Joseph Mature (originally listed as Victor Joseph Mature on his birth certificate). 2. WHAT WERE HIS PARENTS NAMES? His father was Marcello (Marcellus) Gelindo Maturi (Mature). His mother was Clara (Ackley) Mature. 3. WHEN WAS HE BORN? He was born on January 29, 1913. 4. WHAT RELIGION WAS HE? 5. CAN YOU TELL ME ABOUT HIS FAMILY? 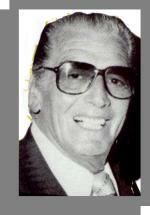 Victor was very happily married to his lovely wife Lorey from 1974 until he passed away in August of 1999. They have one daughter, Victoria. 6. CAN YOU TELL ME WHICH MOVIES VICTOR APPEARED IN? A list of Victor's movies can be found here.